One thing I miss most about Hong Kong is the Thai food. Although there are tons of Thai restaurants all over New York, none of them can beat the Thai food in Hong Kong, and specifically Sweet Basil's. This restaurant is my family's favorite go-to restaurant, and looking through these photos I took from the meal, I cannot believe the four of us actually finished almost everything we ordered. Pork neck: So flavorful and served with the best spicy and tangy chili dipping sauce. Baby oysters: These fried baby oysters cooked with scrambled eggs are very tasty and arrive at the table still sizzling in the iron plate it's served in. Fried rice with seafood and pineapple, HK$108 (US$14): I love the sweet and saltiness of this fried rice. The seafood mixed in isn't amazing-- mainly imitation crab and chewy squid, but the rice has a generous portion of cut up pineapple, and is served with pork floss (肉鬆)! Fried rice with shrimp paste, HK$78 (US$10): My sister insisted on ordering this rice in addition to the pineapple fried rice that I wanted. It was a good idea, because this one was a better mix for the curry. This rice has a strong salty shrimp taste, and is cooked with spring onions, purple onions, and small shrimp, served with a side of beef. Green curry with chicken, HK$90 (US$12): The most superb green curry I've ever had in my life. The thickness of the curry is perfect. The dish is both creamy and hearty, with incredible flavors that I don't stop thinking about. A great thing about this curry is that the chicken is always very tender, and there is plenty of zucchini in it as well. Steamed mullet with garlic and lime juice, HK$198 (US$26): Somewhat of a steal for a very impressive seafood dish. This fish is completely soaked in a flavorful soup. It's served on a lit stove, so make sure to ask the server to turn it off within 5 minutes so that the fish does not overcook. There is a separate bowl on the side with cabbage and mushroom already cooked in the same broth, which you can add to the fish or drink as a soup. Fresh mango with sticky rice, HK$80 (US$10): Sweet Basil always manages to source fresh and ripe mangos no matter what time of year it is. The black & white sticky rice was hot and amazing with the sweet mango. 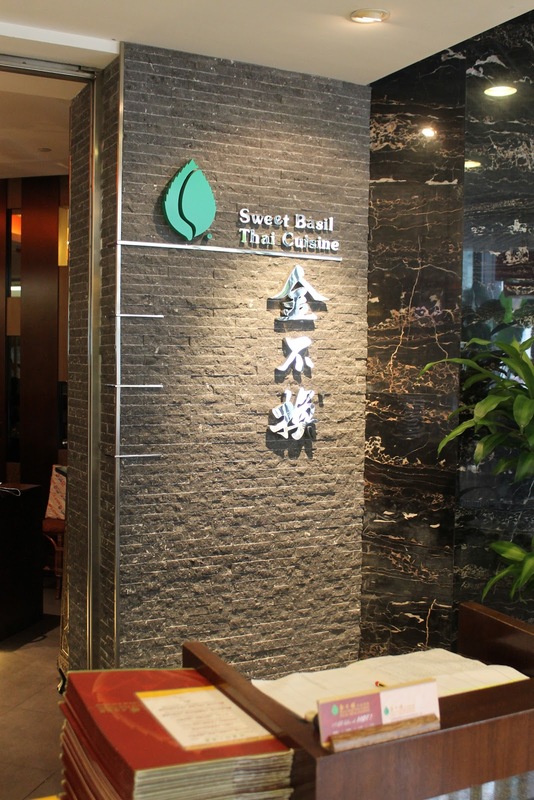 Even if you are only in Hong Kong for a short visit, plan to stop by Sweet Basil for one of your meals!